Griselda Sarmiento, mother of Bianca Sarmiento, an STC student who passed away in 2016 due to brain cancer, accepted her daughter's degree at STC's commencement ceremony, Dec. 16, 2017. McALLEN — For many in the Rio Grande Valley, December 16 was a momentous day. South Texas College hosted a ceremony for graduates at the State Farm Arena and awarded 893 diplomas. While this was a celebration in and of itself, it held a greater significance. The first diploma awarded was given not to a student, but to the mother of Bianca Sarmiento— a former student who once studied in the sign language interpreter program. For the Sarmiento family, the day marked the (nearly) one-year anniversary of the death of their child. At the age 24, Bianca was diagnosed with a glioblastoma — a brain tumor. Before she had the opportunity to graduate, take the state-licensing exam to become an interpreter or fulfill the rest of her life, Bianca lost her battle. 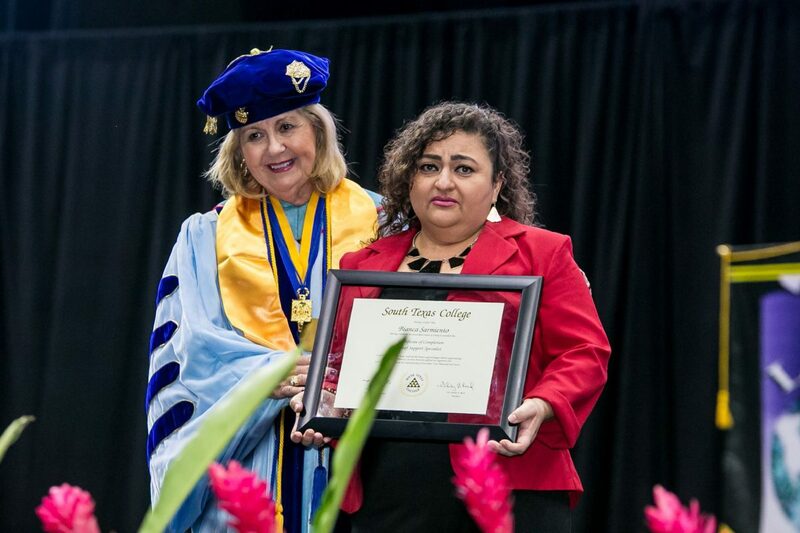 While she was unable to make her walk across stage herself, following in the steps of the board of trustees and the jaguar mascot, her family was honored to stand in her presence and accept the degree on her behalf. Screens broadcast the entire ceremony. Two of them were designated to the hearing impaired, featuring a sign language interpreter translating spoken words to a readable vision. According to her aunt, Patricia Rodriguez, Bianca loved school and interacting with people and always set goals. “Since she was little, she always had a motivation,” she said. Bianca’s mother, Griselda Sarmiento, said what fueled her desire to become a sign language interpreter was her firsthand experience in witnessing the communication struggle deaf people faced. Before her death, Bianca worked at a finance company where she came across many deaf individuals and was thus motivated to learn how to sign. Those closest to Bianca, her mother, father, younger brother and aunt, sat in reserved seats along the front row. “It’s an honor to be here present for her. … She would speak with her professors and told them she would finish getting her degree and begin her career to show her family that everyone could achieve something in their life,” said her mother in Spanish. Outside of her studies, Bianca was involved in the Hand In Hand Interpreters Club at STC and spent her time volunteering to assist with community efforts related to deafness, according to Jovonne Delgado, coordinator of the sign language interpreter programs at STC. Her nature to accommodate and care for others, extended to her younger brother, Nemorio II. He shared one of his fondest memories of his sister. After going through an appendix operation, Bianca helped him get on his feet again and was always there for him with encouragement and advice. Delgado had Bianca as a student for one year from before and after she was diagnosed. She described her as “strong spirited” in all the time they were acquainted and said she would make frequent visits to her office to check that she was succeeding. “What made her excel even more in my eyes was when she faced this hardship… she pushed forward,” said Delgado. Bianca constantly had to travel to Houston or San Antonio for her treatment. Even during this time, Delgado said she kept up with assignments and would attend class as frequently as was possible. Ramirez said, “the diagnosis didn’t put her down. It never stopped her,” as Bianca continued with her studies to the very last day of her life. Her family and Delgado were in agreement that Bianca was present in spirit.